Precision Optical has been doing business in Broken Arrow for more than twenty years. Founded by George and Mary Dakil in 1994, the store features one of the largest selections of sunglasses and prescription eyewear in the Tulsa area. Precision carries popular brands like Ralph Lauren, Ray Ban, Kenneth Cole, Vogue, Vera Bradley, and Covergirl, just to name a few. Their products range from tradition frames to rimless, regular sunglasses and prescription, and safety glasses and sporting brands as well. Humans first began using eyeglasses sometime in thirteenth century Italy. In 1784 Benjamin Franklin invented the bi-focal lens and Americans have been cranking out creative eyewear ever since. Precision Optical is up to date on all the latest trends, fashions, and most importantly, technology. From anti-reflection coating and polarized lenses to transitions lenses and sports goggles, all of your eyewear needs can be filled at Precision Optical in Broken Arrow. 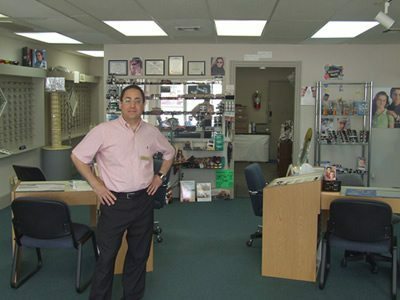 Whether you're new to eyeglasses or have been wearing them all your life, George can help you with whatever your needs are. From alternative materials for individuals with polycarbonate allergies, to innovative materials such as wood and bamboo, Precision Optical is the place to go for Broken Arrow eyeglasses. Located at 520 South Elm Place, Precision Optical is located right in the heart of Broken Arrow, just four minutes from the Elm Exit of the Broken Arrow Expressway. Not only is Precision Optical a great place to purchase new lenses, they are also a great place to repair your broken frames. Whether your problem is the hinges, the nose pads, or bridges, they have state of the art methods for repairing your eyewear. Whether your needs are medical or aesthetic, shopping or repair, Precision Optical is your full-service Broken Arrow optical one-stop-shop. With decades of experience and a love for their industry, you can count on good service, a warm smile, and attention to your needs and budget. Click here to visit Broken Arrow's premier optician online.